I've got my hooks in some yarn. Well, what's so new about that, you say? I'm thrilled to say that it's Scheepjes Stonewashed! Since first seeing this lovely stuff around the web I fell in love with the "washed" effect, the colors ranging from pastels to brights, and the fiber being primarily cotton (80%) with the added strength of a bit of acrylic (20%). Then, when I finally got my hands on it, I fell in love with the softness, too. I'm smitten. Would you look at those glorious colors? 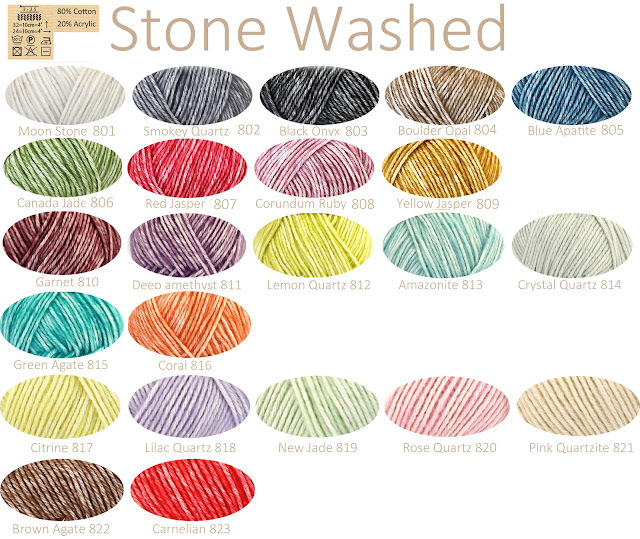 Notice that the names are after precious gems and minerals--a lovely idea for a yarn with a "natural" feel. The yarn is lightly plied with a small "halo" which I suspect may make frogging a bit of a challenge. Because of this, I might opt for a tad larger hook than suggested (3-3.5mm). I'll play with it--but I'm thinking a 4mm might be perfect. I'll let you know how it goes. I like that the yarn comes in a good sized 50g (1.75oz)/130m (142yd) ball. 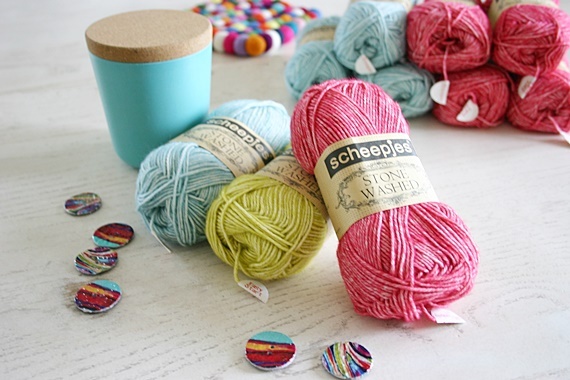 Just enough to make a good sized project, but small enough to be affordable for smaller multi-colored projects. Oh, my head is a-swirlin'! 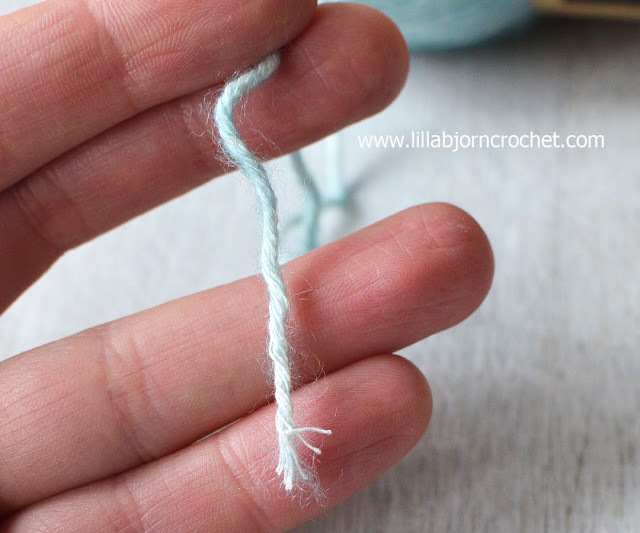 The yarn would be appropriate for garments and toys or blankets and home decor. I'm planning to make an accessory with mine. I think it will be perfect for what I have in mind. But you'll have to stop by next week to see more. Now, I need to decide if I can make it in a single color, or if I am going to need to mix things up as usual and make a multi-colored project. It'll be a surprise for both of us! There is also a Stonewashed XL version (worsted/aran) for those projects where you might want a bit bulkier yarn. You can find Stonewashed (with international shipping) from Wool Warehouse (UK) *here, Deramores (UK) *here, Knotty House (Canada) *here, or LoveCrochet (US) *here. If you are in the Netherlands, you can find a list for local shops that sell it here. Don't miss out on a single post--so stay in the "Button" loop on Facebook here, Instagram (@FeltedButton) here or Pinterest here. I love that quote, too! Best to you on your journey. I have to agree, I'm currently making baby blanket with the 4 ply in green agate, Amazonite, moonstone and smokey quartz. I've been using a g+ hook and the drape is just perfect. You're right about the frogging, it's pretty difficult - makes me try harder to get it right the first time. I did try this yarn with Tunisian crochet, I wouldn't recommend it as the right hand side gets really fluffy. Thanks for this info! I started my project today, and didn't have any trouble with the frogging, but it's a rather loose stitch, so maybe that's why. Here's to a pretty blanket! I love your color choices.